The birth of a baby - this is probably the most joyfulevent in the life of every family. And in such a happy moment it is important to pay due attention to the future child's room. It is only at first glance it seems that everything is simple. In fact, you need to clearly think through how and where will be placed all the pieces of furniture, what color the wallpaper to give preference, as well as what form of beds, chairs and tables will be the most safe for your child. 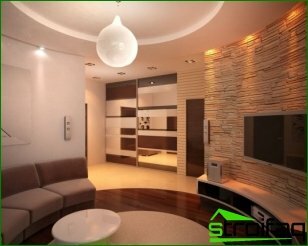 It is better to outsource it to specialists, and here you can order the interior design. So do not delay it indefinitely, proceed. 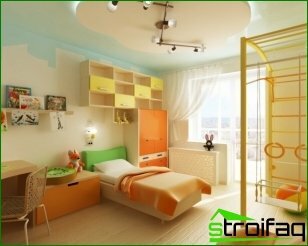 Firstly, do not forget that the children's room - it is a universal space, which performs the duties of not only the bedroom and living room, game room, dining room and even the office. The exact distribution in the room should not be. At least for the simple reason that if the baby does not take in head to play next to the bed, and, for example, under the table, he could safely do so. 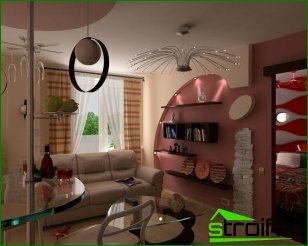 Second, do not overload the room extrafurniture and other interior items. Suffice it to the minimum necessary: ​​a bed, a table, a few chairs, a cupboard. Chad will delight the presence of small bright and colorful shelving units with baskets, which will be all the necessary things, as well as toys. 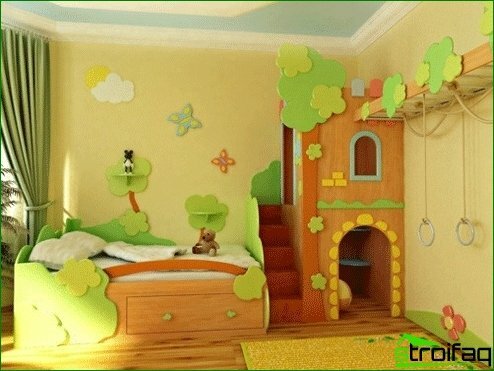 Pay special attention to color designa child's room. Remember that bright, bright and saturated colors can tire the child's visual memory. 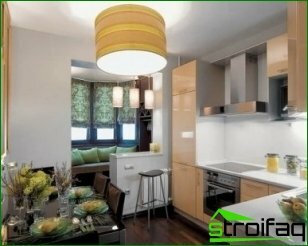 Opt for warm and not too bright colors: milk, cream, beige, pale green or lemon. If your child is already three years old, and he longs for independence, then choosing a bright red or dark brown wallpaper in his room, offer him a compromise. 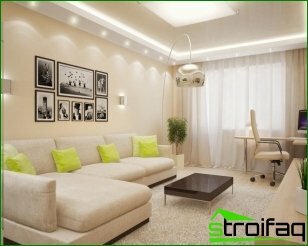 For example, let the wallpaper will not be too bright color, and any accessory (floor lamp, chandelier, additional bedside table) you will get to taste the baby. When choosing a floor covering note of the fact,that will have to wash the floors frequently. After all, children are by nature not very attentive and careful and careless overturned flower pot or paint spilled on the floor can result in a real repair. 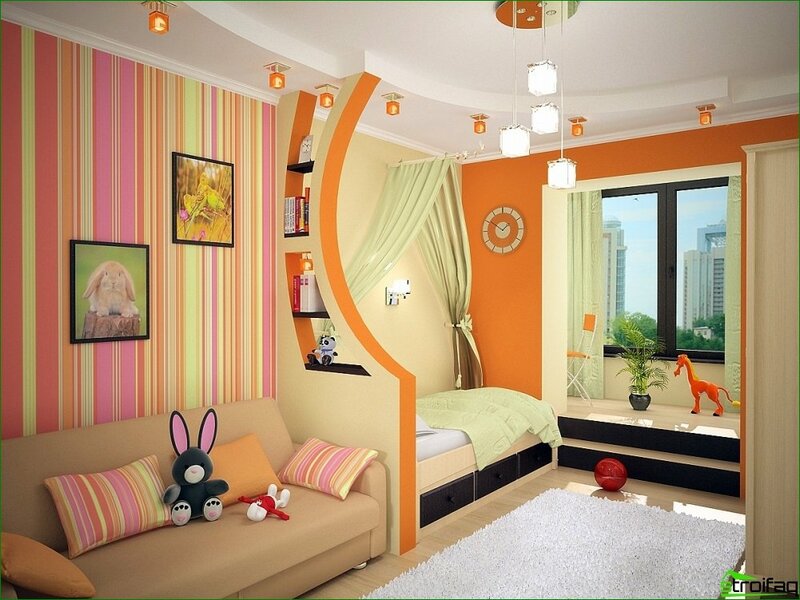 If you are no child of a year, the general cleaning in such a room should at least be carried out once a day. 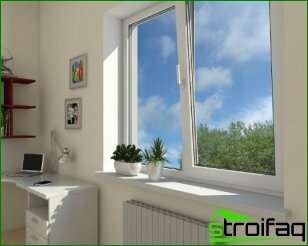 For these cases the perfect combination of several construction materials. For example, linoleum and cork floor boards and laminate or parquet and linoleum. 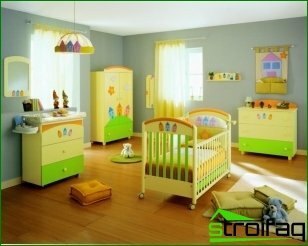 Remember that your safety and healthbaby - fundamental criteria when choosing a child's room interior design. Give preference to natural materials. 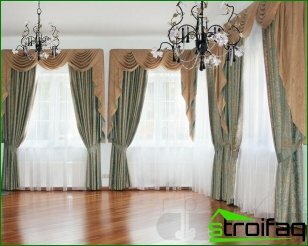 Bed linen, blinds, curtains and other interior elements must be made of special fabric companion. After all, your goal is the main goal: to make sure that your kid was convenient and comfortable in my room!